We have an interesting juxtaposition in these two cards, one that I find resonates with me particularly just about now. 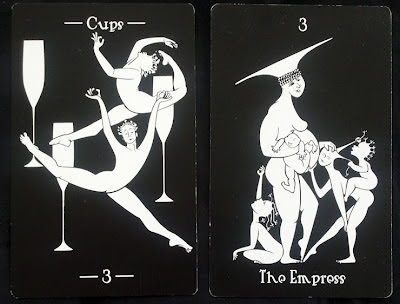 In the first, the three of cups, we see two figures, dancers moving gracefully betweeen three champagne flutes. They are free, they are full of energy, and they are engaged, each following their own steps, but in tandem. Celebrating and enjoying themselves. A productive, beautiful kind of socialization. How do these come together, then? Well, I've a friend, a former college roommate, coming down from Boston to visit me tomorrow night. She's staying until Monday morning. A good friend this is, yes, one of my closest. And yet I find that, rather than feeling excitement for the time we'll get to spend together, mostly I feel like this Empress. Too many things to do and not enough time or energy to get them done. I still need to clean, do laundry, set up the air mattress I had to go out and buy, and so much schoolwork to do and how will I keep up with that without leaving her to feel bored, and so on. I think being a host to most kinds of social events is like this, to some degree, depending on circumstances and temperament of those involved. Whether you are having out of town guests, or hosting a party, or a wedding, anything really...I remember as a kid I hated when we had guests because my virgo mother would shift into MUST CLEAN ALL THE THINGS mode and really, most of the time, whatever the social thing we were doing was, it never really seemed worth all the energy and stress that went into preparing for it. Casual social things tend to be much nicer. Go out, meet up with someone, do a few things. No champagne flutes or fancy dances needed.